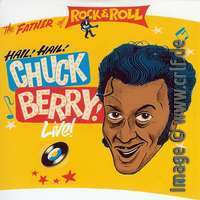 There are hundreds of audience tapes containing Chuck Berry shows from all over the world. Few of them are worth listening to and even fewer are worth releasing. A couple of weeks ago a new CD called Hail! Hail! Chuck Berry! Live! became available containing two shows which are really worth listening to. Although the CD says "This CD-R is a non commercial product and is for private use only", it is professionally made with a printed cardboard envelope. The label is called ROUGH. There is no catalog number, but the barcode reads 640509040147, so we take this as the catalog number. It's interesting to note that Berry is backed by professional Jazz musicians from Belgium: Willy Donni on guitar, Willy Albimoor (Willy Noël De Moor) on piano, Ed Rogers (Roger Van Hoverbeke) on double bass, and Eddie Hunton on drums. Besides his greatest hits, Berry also performs his latest singles and The Things That I Used To Do, a blues by Guitar Slim. Further 14 tracks on this new CD come from a September 1980 show at the Seattle Arts Festival "Bumbershoot". Again this recording is of highest sound quality. It probably was recorded and broadcast by Seattle radio station KSIW. At least KSIW DJ Gary Crow introduces Berry and the band and promotes the radio station. Fred, Thierry and myself spent some time trying to find out who backed Berry at this show. Crow introduces them as the "Northwest All Stars" and they are much better than the average pickup band Berry used to play with. The guitar player and the piano player both get time to solo which is a strong indication for Berry really liking their play. With the help of Eric Predoehl and Ned Neltner we finally got into contact with guitarist Barry Curtis (ex-Kingsmen) and drummer George Rudiger (of Jr. Cadillac) from the band. Both Barry and George remember the show well. They report that the electric piano was played by Tom "Cadillac" Katica (Jr. Cadillac as well), who died in 2010. They didn't know the bass player who was traveling with Berry. This indicates that here again we hear Jim Marsala playing. Besides all his greatest hits, the show includes nice versions of You Don't Have To Go and Baby What You Want Me To Do written by Jimmy Reed as well as Lousiana Blues written by Muddy Waters. Note that in contrast to the known audience tapes, the show on this CD has been shortened. Due to time limitations, Johnny B. Goode was excluded, Reelin' And Rockin'/House Lights was shortened by two minutes. Also missing is the introduction by Gary Crow and an initial guitar instrumental based on Rockin' At The Philharmonic. Right now we haven't seen this CD offered in stores or mailorder catalogs. It is offered on ebay, though.